The evening began with Marg Fenn, of Hachinoki Pottery, discussing the upcoming pottery workshop for the Saturday September 16th meeting. Following this, a little “Show & Tell”. 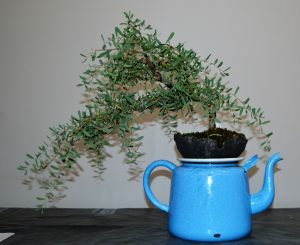 The first tree was Marcela’s Coastal Tea-tree on a tea-pot stand (apparently a last minute arrangement). Marcela’s Melaleuca linariifolia was next which, at an earlier stage, was a couple of metres tall. Peter’s Lilly-Pilly was next which displayed nice flaking bark. 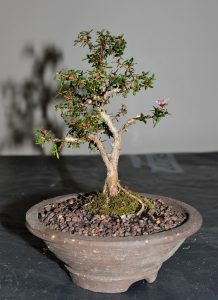 Last was Tom’s little Leptospermum sp. from nursery stock. 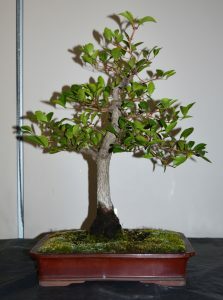 The main part of the evening was a slideshow presentation by Quentin entitled “Plant Physiology & Structure – How it relates to Bonsai”. 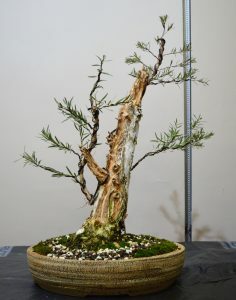 Quentin referred to his Coastal Tea-tree to illustrate the relationship between branches and a lifeline link to a specific root. Discussion was detailed and covered tree structure, including roots, trunk/branches and flowers, and included plant processes focussing on water uptake from roots to leaves and photosynthesis.